A stronger more reliable foundation. ICF foundation walls resist buckling and cracking better than conventional walls. The strength is reiterated through the high wind resistant, fire rated assembly, resistant to termites (the concrete), and is impact resistant. On top of that the strength is permanent. Your foundation will not rot or decay resulting in a no maintenancefoundation. Being that there are no cavity walls mold, mildew or even bugs or rodents are not a concern of an ICF Foundation. 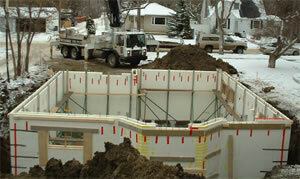 Our ICF foundations have another leg up on conventional foundations. The Advantage ICFsystem is vapor barrier approved, so your foundation is ready for drywall upon the curing of the concrete. No framing, insulating or vapor barrier needed. The tabs within the block allow the builder to attach the drywall directly to the block. We want to build our customers a home they are comfortable in. The ICF block allows us to do this as we can offer a solid foundation that will allow the homeowner the comfort that they should have in their building process. It only makes sense to place you investment on a solid foundation.